North east trade specialist, Sekura Window Centre, has signed up to become the latest fabricator to manufacture aluplast’s innovative Lift-and-Slide patio door. The ultra-thermally efficient it’s been designed to deliver u-values as low as 0.65 W/m2K, meeting Passive Haus equivalent standards. 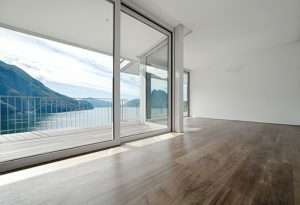 Available in aluskin, aluplast’s click-and-fix external aluminium cladding system, Sekura Managing Director, Alan Hall, said the system would support its customers in pitching a highly energy efficient and more affordable alternative to aluminium bi-folding doors into new build and retail markets. “We supply aluminium bi-folding doors but they’re not right for every job or every location”, he said. “The new build sector wants more thermally efficient products and you just can’t get close to some of the specifications with aluminium bi-folds. Capable of spanning openings of 6.5m X 2.8m with just two sashes, the aluplast Lift-and-Slide door delivers impressive design flexibility. This includes uninterrupted sightlines as standard and an ultra-low a new low-sightline option on the fixed sash of just 32mm, maximising the glazed area of the door. It exploits proven technology in its opening and closing system. Sashes are mounted on an easy-lift mechanism that elevates when opened and lowers on to the track when closed. So, a fully closed door rests over lower weather seals improving the door’s weather tightness, thermal and acoustic insulation. The aluplast Lift-and-Slide door also features an option dual slide option. This allows the panels to slide across each other delivering even greater design flexibility. It’s supplied by aluplast in three primary configurations. This includes a standard PVC-U door to a premium offering fabricated to ultra-energy efficient options, accommodating glazing units of up to 52mm. The performance of the standard door can be further enhanced with the addition of a thermally efficient upper guide rail and extruded insulated profiles. In addition to standard white, the aluplast Lift-and-Slide is available in a choice of 27 ex-stock and special colours on lead times of 15 working days or less, plus Woodec, aluplast’s next generation foil. Unveiled at the beginning of this year this replicates the natural appearance of timber while combining it with the through-life advantages of PVC-U. Ian Cocken, Director of Sales and Marketing, aluplast, said: “Energy efficiency is a key driver in new build while the lift-and-slide mechanism itself and our aluskin aluminium fascia system also generates a high level of end user appeal. “Fundamentally, however, the sightlines are important. The reality is that bi-folds remain closed for most of the year and often most of the summer, so you’re looking at uprights, our Lift-and-Slide door delivers a flexible year-round connection between home and garden.